Vietnam offers an intoxicating mix of natural wonders and cultural intricacy; a beautifully diverse hub of Southeast Asia that’s characterized by adventure, bursting with flavour and rooted in a dramatic history. 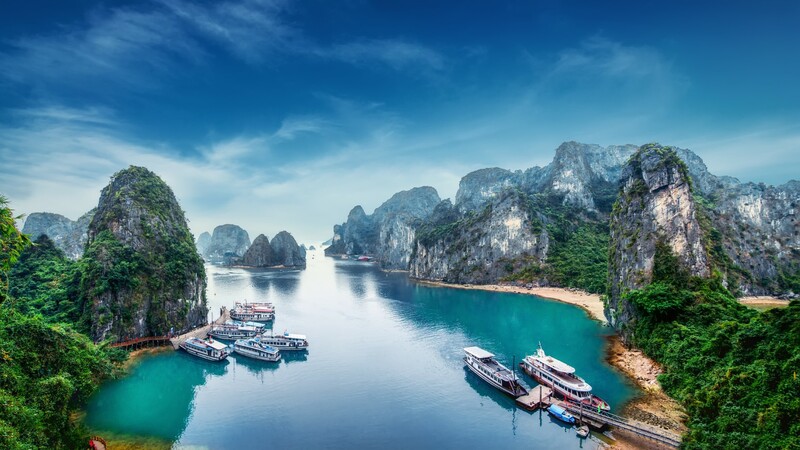 From the bustling hubbub of modern cities, where ancient pagodas rub shoulders with neon bars and skyscrapers; through misty highlands clad in rice terraces, where buffalo wade alongside farmers in conical hats; to golden beaches and towering karst formations, sprinkled over the emerald waters of the South China Sea; Vietnam truly has it all. 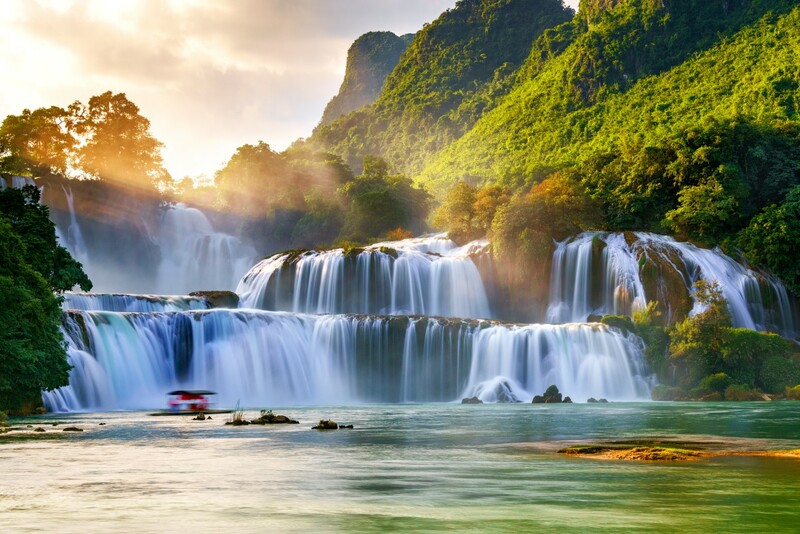 Those in search of green on their travels will find a garden of treasures in Vietnam, where pristine beaches, untouched islands, soaring mountains and steamy jungles combine to form a landscape as varied as it is beautiful. From the Mekong delta in the south, to golden dunes and karst formations in the north, the nation really packs a punch when it comes to scenery. Head to Con Dao Island for deserted beaches, coral reefs, mangroves, wildlife and diving, or search for sea turtle nesting grounds in the national parks. 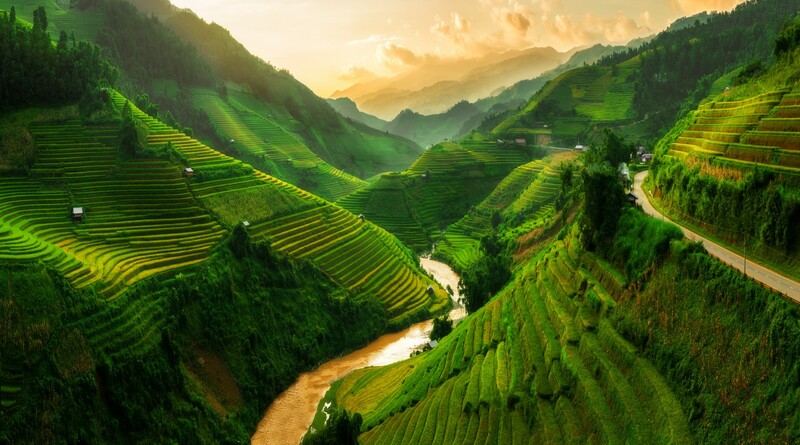 The southeast is known as the rice bowl of Vietnam, where a rolling vista of fruit orchards, rice paddies and floating markets fan out like arteries on the mighty Mekong. Here you will see a timeless way of life – where residents ply their trade on traditional Sampan boats and floating markets add a splash of colour to the landscape. Vietnam is home to almost 100 million people, many of whom are packed into the swirling motorcycle cyclones of the nation’s two major cities – Hanoi in the north and Saigon to the south. Hanoi – known as the ‘Paris of the Orient’ – is the cultural heart of Vietnam, where Parisian style meets the vibrant energy of Asia. It is here where you will also find scenic lakes and leafy boulevards, threading their way between French colonial buildings, eleventh-century ruins, modern high rises and colourful pagodas. Away from the chaos of the main streets, women practice Tai Chi in the park, whilst farmers set out their stalls in the winding alleys of the old quarter. More sedate than Saigon in the south, Hanoi offers old-world charm in synchrony with its modern sprawl. 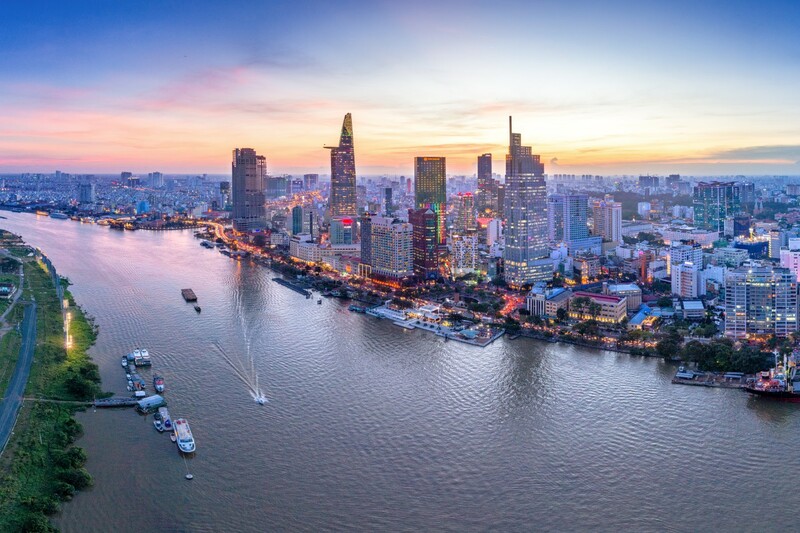 Ho Chi Minh City - formerly Saigon – is the original pearl of the orient, where new and old collide; skyscrapers, clubs and restaurants share the skyline with pagodas, ancient markets and monks wandering from temple to temple. The compelling and often turbulent history of the city adds to its wild and chaotic modern character. 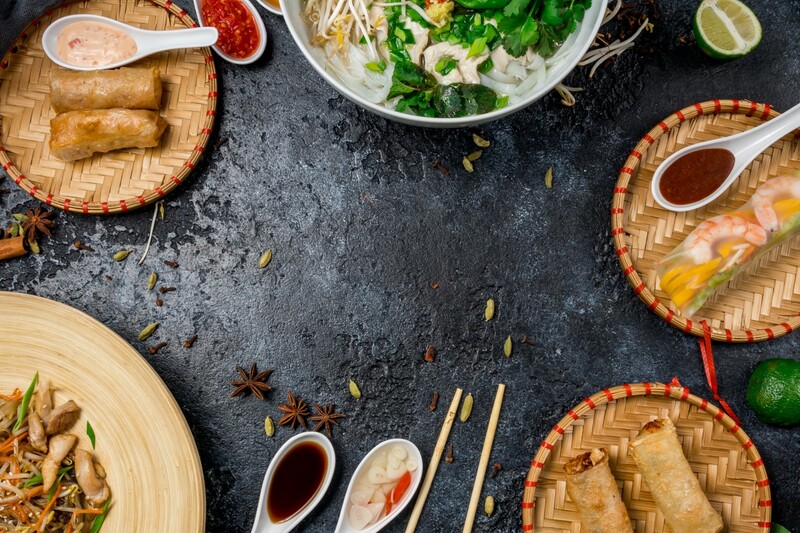 Vietnamese cuisine is distinctive and delicious, blending salty, sweet, sour and spicy flavours, all tied together in the ubiquitous nuoc mam dipping sauce. Each dish is given a flavourful twist with combinations of cane sugar, kalamansi citrus fruit or tamarind and chili peppers, whilst liberal helpings of fresh herbs add extra colour to the table and unmistakable aromas to the kitchen. All along Vietnam’s great noodling coastline, there’s excellent seafood dining to be found; in places like Nha Trang, which is the nation’s beach capital, scenic mountains provide a backdrop for beachfront parks and sculpture gardens, stylish restaurants and bars. Here is where the unique flavours of the nation come to the fore, in superb seafood dining, complemented by party culture and nightlife. Hoi An is a UNESCO-listed, former merchant trading post in a picturesque riverside location, home to ornate architecture and ancient cobbled streets. Influenced by centuries of trade and an influx of cultures from China and Japan, the region’s multicultural character is evident in the many restaurants, cookery schools and markets. Hoi An’s pedestrianized streets provide some respite from the traffic, adding to the laidback charm of this sedate and historical city; the perfect place to stop for a bite and get a true taste of Vietnam. Whether you’re into cultural immersion, natural spectacles or white-knuckle water sports, Vietnam is guaranteed to get your pulse racing. This is a nation on the move, where a blizzard of bikes fizz along the city streets, switchback rides burrow into the jaw-dropping Hai Van Pass and traditional junks trundle between karst towers in the emerald waterways of Halong Bay. Try hiking in evergreen hills around Bac Ha or Sapa, or experience kitesurfing in Mui Ne; a seafront beach complex built around an old fishing port, known as the adrenaline capital of southern Vietnam. This is a popular surf destination from August to December when the waves are high, whilst billowing winds in October to April carry kite surfers over golden dunes along the coast. Saddle up, set out and get in sync with the high-octane rhythm of a nation. The customs and cultures of Vietnam are as varied and complex as the landscapes that support them. Here, a combination of jungle paths, mountain passes, river deltas and labyrinthine city streets ferry people from all over the nation to where they are going; in turn, each traveller carries with them a piece of where they are from, adding colour to the mosaic of cultures that make up Vietnam. Journey to Sapa - a former French hill station in the Tonkonese alps – to find lush valleys, verdant rice paddies, age-old ways of life and proud tribal communities living out their ancient customs on spectacular mountain slopes. 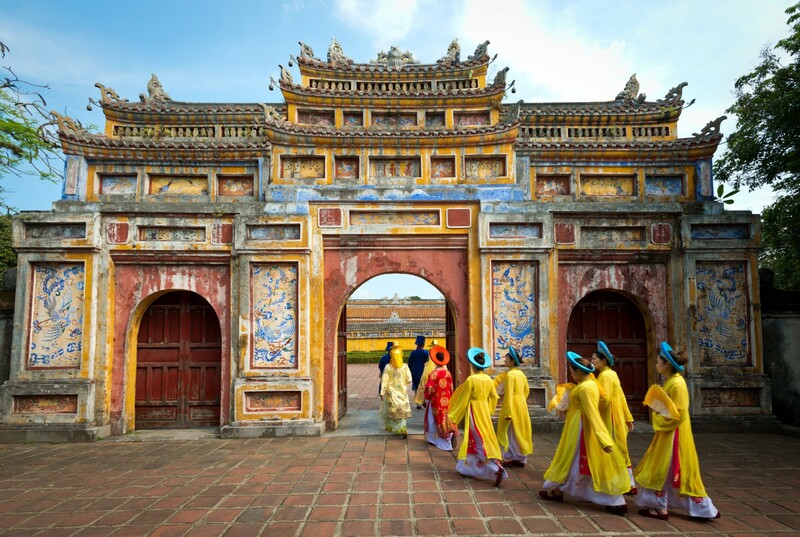 Right in the middle of Vietnam is the imperial city of Hue; similar in its sensibilities to Beijing, Hue is home to an ancient citadel and catacombs, along with its very own forbidden city - a UNESCO World Heritage site that offers a glimpse into a once mighty empire. Visitors can cycle past rice paddies along the banks of the perfume river and make stops at pagodas where young monks serenely go about their training. 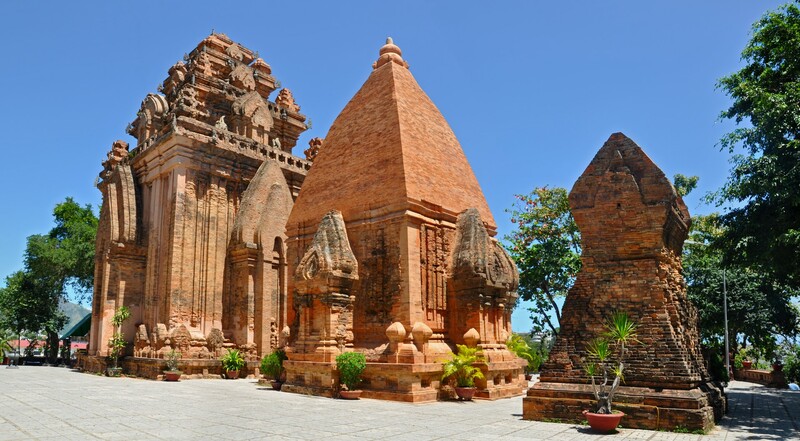 A trip around Vietnam is a journey through world history that makes stops in many centuries. Urban trading quarters and market towns are rich in indigenous crafts and reflect generations of merchant trading from far and wide, whilst ancient temples in the north echo a thousand years in the Chinese empire, and the iconography of Hinduism continues to reign supreme in the south. The nineteenth-century French colonial period bestowed many hill stations in the jungle interior, along with spacious boulevards and regal palaces lining Vietnam’s cities, giving some places the appearance of a tropical Champs-Élysées. In the twentieth century, the collapse of French control and the nation’s struggle for independence and unification under communism catapulted Vietnam onto centre stage in the Cold War and led to the Vietnam war – known locally as The American War. Networks of Vietcong tunnels, remnants of the Ho Chi Minh trail and poignant relics from the lumbering US war machine continue to serve as testaments to tragedy in Vietnam’s recent history. From imperial China to French colonialism, Japanese occupation and American conflict, Vietnam has long attracted outside influence and played a vital role in sculpting world history. Today, the nation also has a hand in shaping the future, located at the epicentre of East Asian power and prosperity, its city skylines boast the glass, steel and corporate clout of a dynamic, modern and prosperous tomorrow.